This will be the first of series of articles about life at the Line of Contact between Armenia and Azerbaijan. During the the past several years, our newsfeeds have been filled with news about the tension at the border between Armenia and Azerbaijan, resulting in the loss of lives, military and civilian, and property damage. 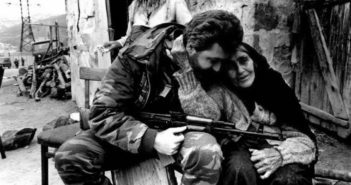 Although most of Armenia’s population lives in peace, the people living in border villages are still at war despite the end of large scale military operations in 1994. At the end of the Artsakh War for Independence, on 12 May 1994, a ceasefire agreement was signed between the representatives of Armenia, Artsakh, and Azerbaijan in Bishkek, Kyrgyzstan. While the agreement stopped the war, the absence of a peace treaty between the parties has been used by Azerbaijan, the losing side, as an excuse to perpetuate violence. Flush with oil wealth, burdened by the memory of an embarrassing military loss, and trying to contain a fragile political base, the country’s dictator, Ilham Aliyev, regularly inflames tensions with Armenia, resulting in both civilian and military deaths. Border or Line of Contact? Armenia and Azerbaijan both declared their independence in 1991 but, as they were engrossed by war, there was no official border recognition between them. For any border to have official and international recognition, there has to be a clear demarcation of land and an agreement between the neighboring countries. This is not the case with Armenia and Azerbaijan. Instead of a demarcated border, there is an armistice line, referred to as the Line of Contact, which comprises several military posts, trenches, and minefields. The military posts change from time to time depending on the military situation. This was witnessed in June 2014 at the Line of Contact with the Nakhichevan region when the Armenian Armed forces advanced several kilometers and took over a high-altitude (3360 meters / 11,023 feet) mountaintop. This was later on confirmed (link in Armenian) by Azerbaijan’s defense minister. As such, the international borders which are seen on Google Maps are the administrative borders between Soviet Armenia and Soviet Azerbaijan, as marked on the topographic maps of the Soviet Union, although they no longer exist. Hence, using the term “state border” by officials and journalists both in Armenia and abroad is misleading and could be considered inaccurate. Both Armenia and Azerbaijan had exclaves in the other’s territory during Soviet times. Artsvashen was an Armenian exclave, a 40 km2 territory (an area about half the size of Manhattan) completely inside the Azerbaijan SSR. It was a mostly agricultural area with 719 families. During the war, the villagers were forced to leave while their houses were leveled to the ground by the Azerbaijanis. Today there are several military posts within the abandoned village. On Armenia’s territory, there were three exclaves, two in the Tavush region – Verin Voskepar (previously known as Yukhari Askipara) and Barkhudarli – and one in the Ararat region: Tigranashen (previously known as Karki). The Azerbaijani populations of these areas all left the region during the war. While there is almost no civilian population at the Line of Contact in Artsakh, there are 18 villages in Tavush which are located few kilometers within it: Bertavan, Dovegh, Barekamavan, Koti, Voskepar, Voskevan, Baghanis, Kirants, Berkaber, Aygehovit, Vazashen, Paravaqar, Nerqin Karmraghbyur, Aygepar, Movses, Choratan, Chinari and Aygedzor. One village located around the Line of Contact, Vahan, is located in the Gegharkunik region, south of Tavush; most of Vahan’s residents are refugees from the Artsvashen exclave. These are the border villages which are regularly affected by Azerbaijani machine gun fire, sniper fire, and landmines. Some villages, like Berkaber, Aygepar, and Chinari, are only few hundred yards away from the Azerbaijani military posts. These villages have shared a number of problems, mainly related to security. Life is dangerous for civilians here because the Azerbaijani side regularly targets and fires upon them. Over the years, villagers have adapted to the reality of life in Tavush and have started to build bunkers and hideouts in their villages. Schoolchildren are trained regularly on how to avoid minefields and how to handle emergency situations. The majority of the local population’s agricultural lands are unusable because they are either minefields or under direct sniper fire. During Soviet times, animal husbandry was very common in the region but today, villagers avoid it due to the risk of losing livestock to minefields and gunfire. The regular tension enforced by the Azerbaijani side takes also takes a psychological toll on local villagers. Under a regular stream of fire, peace seems an ephemeral dream and the uncertain future encourages emigration, especially among the young. Currently the whole Line of Contact is tense. Different types of weapons are used, including automatic rifles, submachine guns and, most recently, tanks. The situation on the Line of Contact fluctuates and seems to coincide with Azerbaijan’s internal affairs. For example, when internal tension rises due to elections or protests, the authorities attempt to divert the public’s attention with operations on the LOC, be that haphazard gunfire or coordinated attacks on military positions and civilian populations. Another reason for the escalation is the lack of discipline, corroborated by Azerbaijani media, in the Azerbaijani army. Frequently, firing upon civilian positions in Armenia is a matter of unruly low-ranking soldiers, instead of an order from superiors. Yet another frequently occurring “coincidence” is the escalation of hostilities by the Azerbaijani side before meetings between Armenia’s president, Serzh Sargsyan, and Aliyev. Despite the provocations, Armenia adheres to a policy of self-restraint and avoids any major engagement with the other side. Nevertheless, the Armenian Defense Ministry has repeatedly asserted its readiness to respond in-kind to any Azerbaijani attacks – a promise it has delivered on regularly. International organizations have been monitoring the LOC since the ceasefire agreement but their assessments have frustrated the Armenian side for their unwillingness to hold Azerbaijan to account for its obvious violations of the ceasefire. The latest example of this was on the October 27, 2015, when the mission from the Organization for Security and Cooperation in Europe (OSCE) conducted a monitoring of the Martakert-Tartar road at the LOC, with the participation of the OSCE Minsk Group co-chairs. When the monitors crossed the LOC toward Azerbaijan, they were welcomed with submachine gun fire from the Azerbaijani side and had to turn back. However, the United States, one of the Minsk Group co-chairs, was not ready to condemn Azerbaijan over the violation in a statement following the incident. Another example was in July 2014 when representatives from the International Committee of the Red Cross (ICRC) were invited to be present during the crop harvest in Chinari to ensure the safety of the farmers. While the ICRC representative were in the field, along with Chinari’s mayor, the Azerbaijani side opened fire toward the delegation, causing damage to their vehicle (which had a large ICRC flag), causing them to leave. Nevertheless, the statement released by the ICRC following the incident because there was no mention of Azerbaijan. 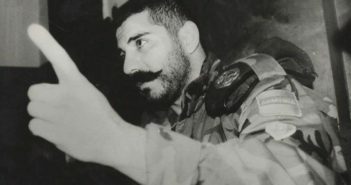 Despite its timidity in condemning the Azerbaijani side, the ICRC remains the only channel through which prisoners of war can be safely exchanged. As part of its mandate, ICRC also conducts humanitarian projects on both sides of the LOC by providing drinking or irrigation water to villagers. Based on the current situation, peace does not seem to be on the horizon. But, the risk of large-scale operations is very low: neither side has much reason to restart the war. Although it has an interest in creating a climate of fear in the villages along the LOC, Azerbaijan cannot expect to launch any full-scale military operations until it is certain that it can occupy strategic posts inside Armenia’s territory. With Armenia’s highly-trained military monitoring the LOC, that is an unlikely scenario. For now, farming amid landmines and living with the threat of sniper fire will continue in the villages along the Line of Contact. 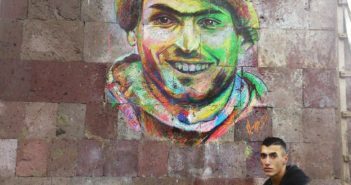 In this corner of Armenia, peace cannot come soon enough. I do not agree that Armenians are not breaking the cease fire – I am a Turkish citizen – I don’t believe the news on either side. Both Armenia and Azerbaijan are both at fault and lying – though when Azj. doesn’t report something it’s because it wants to keep the peace. If NKR doesn’t want bloodshed maybe it should stop aggravating the Azj. side. As this article states, Azj is oil rich – it just wants to be left alone. All “aggression” comes from Armenia poking at it. Mr. Atas, the Baku games gave us and the European side a solid proof that the aggressor is the Azerbaijani regime. During the games, the situation was perfectly calm on both sides of the border and the farmers on both side were able to work on their lands freely and safely. You can check this info from the villagers of mezem, abbasbeyli and alibeyli. Once the games were over and the international journalists left Baku, Azerbaijan restarted the escalation. The same happens prior to every meeting between the presidents . I thought this was a very calm, reasoned and rational statement by an unbiased Turkish onlooker. He’s right you know. When Azbjn shot down that helicopter, Armenia cried “fowl” when it should have been crying “foul”. Thank you for your sage advice, Emir. Why does my randomly generated avatar look like a yellow robot shwanz? I love how at the beginning of the post he’s feigning impartiality and by the end of the post he’s pointing fingers and taking sides with a decided bias (“all aggression”). Just one of the very many reasons why Turkey should never be considered a mediator in the Karabakh conflict (or most conflicts in their immediate region, really). Good thing we have actual video of the incident as proof that the helicopter was patrolling within NKR territory and fired upon from Azeri positions as a provocative act. These occur frequently, especially as noted by by international moderators being fired upon. Perhaps now, with Azeri oil money dwindling, the parties responsible for maintaining the peace will be more willing to call out the offending side. Any time Azerbaijan provocatively attacks Armenian positions, international mediators speak of “both sides”, yet, more often than not, the action is unilateral. How quaint that Emir here, a Turk refuses to grasp this fact. Imagine after every Russian violation of Turkish airspace, the international community, instead of condemning Russia, would call on “both sides” to maintain civility? That’s exactly what’s happening. [Ahmet Davutoglu, who has become the first Turkish foreign minister ever to visit Uighur Autonomous Region in China, toured historical sites in Kashgar city. Davutoglu and an accompanying Turkish delegation arrived early Thursday in Kashgar in the extreme west of China and the extreme southwest of Uighur region. Davutoglu first visited the tomb of Mahmud Kashgari and then they toured the tomb of Yusuf Has Hajib as well the 500-year-old Id Khah Mosque, the largest mosque in China. Uummm: according to Google Maps the distance from Uguristan to Armenia is about 5,000 kilometers. And since Armenians have been indigenous to Caucasus (including Artsakh) and the Armenian Highlands for at least 5,000 years, and since nomadic Turkic tribes’ homelands are in Uyguristan, we have a bit of a misunderstanding. It seems our uninvited Turk neighbors due East of Artraskh are a bit confused and lost. They seem to think they are in Uyguristan and insist in crowding out the indigenous, sedentary natives. If nomad Turks returned to their native lands in East Asia, things would work out just fine: forgive and forget. Lots of empty land in Uyguristan for hard working, industrious nomad Turks to create a Turkic paradise. There they can live in peace without the “threat” of Armenian “aggression”. I could nott refrain from commenting. Perfectly written!